Bushes bring out the artist in gardeners, turning them into sculptors. Bushes can be trimmed to grow low and shaped anyway the gardener wants, or they can be left to grow as tall as they want. Missouri gardeners have their choice of bushes that grow in the sun or shade, and one can be found for any type of soil. Watch the soil conditions, as the number of times the plant needs to be watered depends on the temperature and amount of rainfall. Scarlet buckeye (Aesculus pavia) is also known as the red buckeye and firecracker plant. The bush grows from 12 to 35 feet tall and produces egg-shaped leaves that are dark green or blue-green on top, white on the bottom and turn yellow in the fall. The red or yellow flowers bloom in March, April and May, measure up to 1-½ inches long and grow in clusters that range 6 to 10 inches long. The flowers give way to brown fruits that reach 1 to 2 inches long. Plant scarlet buckeye in partial shade and a soil that is moist and well-drained. Do not over-water or you run the risk of the plant developing leaf spot diseases. The plant performs best if it gets sun in the morning and shade in the afternoon. Hummingbirds and bees will come for the nectar and squirrels will make a meal out of the nuts. Leadplant (Amorpha canescens) is also known as leadplant amorpha and prairie shoestring. The bush grows 1 to 3 feet tall and produces green, palm-like leaves that are covered with short hairs so densely packed that they make the leaves look gray. The blue or purple flowers appear in June and July growing in spikes at the ends of the branches. Plant leadplant in full sun or partial shade and dry, well-drained, rocky or sandy soils. A soil that is too wet can lead to root-rot and other diseases. Insects will come for the nectar and animals for the fruit. Common ninebark (hysocarpus opulifolius) is also known as eastern ninebark. The bush grows 6 to 10 feet tall and just about as wide. The leaves are medium green, turn yellow or bronze in the fall, resemble those of a palm and grow 1 to 3 inches long. The flowers are less than ½ inch wide, grow in clusters 1 to 2 inches long and bloom from May to June. The flowers are followed by reddish fruit that ripens from September to October. Plant common ninebark in full sun or partial shade. The plant can acclimate itself to different soil conditions from dry to wet. Carolina rose (Rosa carolina) is also known as pasture rose. The bush grows 1 to 3 feet tall with thorny stems. The bush produces green leaves and fragrant, 2-inch wide pink flowers that bloom in May and June, growing as single flowers or in clusters. The flowers are followed by fruit that starts out green and turns a bright red when ripe. 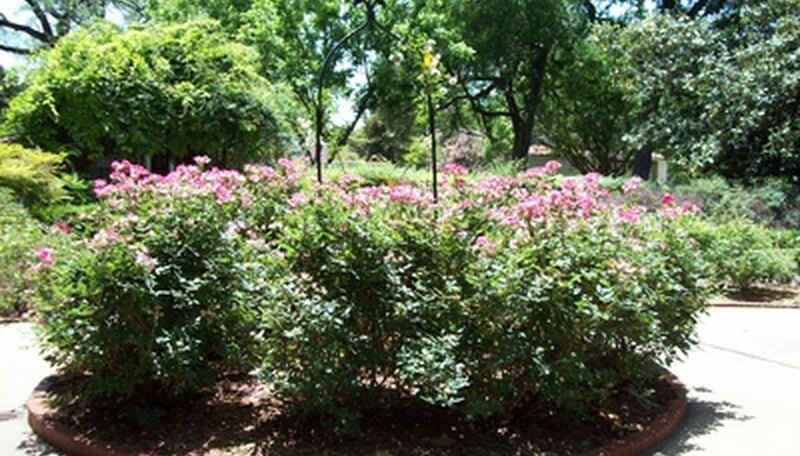 Plant Carolina rose in full sun or partial shade. The soil can be dry, moist or wet. The plant is susceptible to fungal diseases, so give it plenty of room for air to circulate. Birds will come for the fruit.